The White House will recognize ten AAPI artists and advocates in celebration of AAPI Heritage Month. 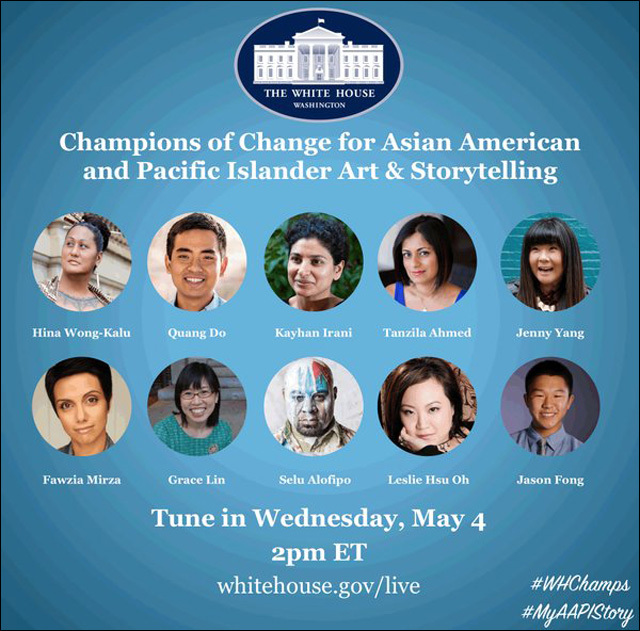 On Wednesday, the White House will recognize ten individuals from across the country as "White House Champions of Change for Asian American and Pacific Islander Art and Storytelling." May is Asian American and Pacific Islander Heritage Month. To celebrate, the White House and White House Initiative on AAPIs are honoring artists and advocates who have used unique channels and diverse platforms to tell powerful stories, increase awareness around key AAPI issues, and encourage diversity and inclusion in all sectors of society. These ten individuals were selected for their leadership and tireless work to raise the visibility of diverse AAPI experiences and create dialogue around issues the community faces. The Champions of Change event will feature remarks by Assistant to the President and Chief of Staff to the First Lady Tina Tchen, National Endowment for the Arts Chairman Jane Chu, and White House Initiative on AAPIs Executive Director Doua Thor. There will also be panel discussions with the awardees, moderated by myself and Jeanny Kim, Acting Director of the Smithsonian Asian Pacific American Center. The event will be live streamed on the White House website at www.whitehouse.gov/live on Wednesday, May 4, at 2:00 PM ET. Follow the conversation at #WHChamps. Tanzila "Taz" Ahmed is an activist, storyteller, and politico based in Los Angeles. An electoral organizer by trade, she's mobilized thousands of AAPIs to the polls in over seventeen different languages in the past fifteen years at various nonprofit organizations, starting with founding South Asian American Voting Youth in 2004. She is Campaign Strategist at 18MillionRising, an Asian American new media organizing group. She is cohost of the #GoodMuslimBadMuslim podcast that has been featured in O Magazine, Wired, and Buzzfeed. An avid essayist, she had a monthly column called Radical Love, was a blogger for Sepia Mutiny, has written for Truthout, The Aerogram, The Nation, Left Turn Magazine, and more. She is published in forthcoming anthology Good Girls Marry Doctors (2016) and poetry collection Coiled Serpent (2016) and was published in the anthology Love, Inshallah (2012). Her third poetry chapbook Emdash and Ellipses was published in early 2016. Taz curates Desi music at Mishthi Music where she co-produced Beats for Bangladesh and she annually makes #MuslimVDay Cards. Her artwork was featured in the shows Sharia Revoiced (2015), in Smithsonian Asian Pacific American Center’s H-1B (2015), and Rebel Legacy: Activist Art from South Asian California (2014). Selu Alofipo is a self-taught expressionist artist who immigrated to the United States from the Island of Samoa in 1983. He received a Bachelor of Arts degree from Louisiana Tech University while on a football scholarship and credits much of his success to the opportunities made available to him through his parent's hard work and family support. As a first-generation Samoan American, Selu feels a tremendous responsibility not only to his family, but also to his Samoan heritage to persevere, progress, and succeed by doing things the right way and by utilizing the values instilled in him as young child--faith, family, respect, and above all, hard work. Selu has returned to his local elementary, junior high, and high schools to speak to students and to personally thank the teachers and administration for their dedication by donating customized original paintings as a token of gratitude. Quang Do is a spoken word poet and student development professional at the University of Alabama at Birmingham (UAB). Quang has worked to empower AAPI youth and has extensive experience as a teaching artist facilitating writing/performance workshops using spoken word as a tool to help communities better understand the personal and cultural needs of the AAPI community. The themes of love, identity, oppression, compassion, and humanity are all foundational to Quang’s poetry. Quang is a multi-time Grand Slam Champion of the Montevallo Poetry slam, TEDxBirmingham 2015 speaker, and top finalist at the Southern Fried Regional Poetry Slam. He currently serves as Coordinator of Student Leadership at UAB where he advises and works with the Black Student Awareness Committee, the Multicultural Greek Council, the Multicultural Council, International Mentors, as well a host of other organizations and programs. Previously, Quang was a full-time touring and teaching artist. Jason Fong, born in Los Angeles, California, is a junior at Redondo Union High School and third-generation Chinese-Korean American. Jason is interested in progressive politics, having written extensively on issues such as police brutality, affirmative action, and immigration. He is the founder of the popular hashtag #MyAsianAmericanStory, which has earned millions of impressions on Twitter. His blog, JasonFongWrites, has been featured in news outlets such as the Los Angeles Times, the Atlantic, NBC, and CNN. Jason has participated on panels about social media, civil rights, and Asian American identity at colleges, including the University of California, Riverside and the University of North Carolina, Chapel Hill. Kayhan Irani is an Emmy Award-winning writer, a socially engaged artist, and a Theater of the Oppressed trainer and facilitator. She designs and directs socially engaged arts projects for community-based organizations, government agencies, and international NGOs. She facilitates workshops and trainings nationally and internationally in Afghanistan, India, and Iraq. Her published work includes Telling Stories to Change the World: Global Voices on the Power of Narrative to Build Community Make Social Justice Claims (2008). In 2010, Kayhan won a New York Emmy Award in best writing for We Are New York, a nine-episode broadcast TV drama created with the NYC Mayor's Office of Adult Education and used as an English language and civic engagement tool for immigrant New Yorkers. She is currently producing Documented cIRCA 86: Immigration Reform Turns Thirty, a multimedia oral history and public engagement project that celebrates the lives and accomplishments of immigrants who found a pathway to legalization through the Immigration Reform and Control Act (IRCA) of 1986. Grace Lin is an award-winning and bestselling author and illustrator of picture books, early readers, and middle grade novels, including the Newbery Honor Book Where the Mountain Meets the Moon. An advocate for diversity in children's book, Grace gave the TEDx talk, "The Windows and Mirrors of Your Child's Bookshelf." Most of Grace's books are about the Asian American experience. Fawzia Mirza is a Pakistani, Muslim, and queer actor, writer, and producer based in Chicago. She has written and produced theatre, web series, short films, documentaries, and more. Fawzia is a creative workaholic and believes in the power of art, storytelling, and comedy to break down stereotypes across all her identities, as well as dispelling the model minority myth seen in both the media and her communities. Fawzia is currently producing her first feature film Signature Move, which is about a Pakistani woman seeking her identity in love and wrestling, and was selected to be part of the 2016 Tribeca Film Institute All Access program. She is the recipient of the 2015 3Arts Award and was named a Rising Star in Indie Filmmaking by WBEZ Chicago and a Top Ten Creative by Indiewire Magazine. Leslie Hsu Oh is an award-winning writer whose work has been named among the distinguished stories of the year by Best American Essays. Losing her mother and brother to hepatitis B at age 21 inspired her to found the Hepatitis B Initiative in 1997, which she later expanded to the Maryland, Virginia, and Washington, D.C. area with Thomas Oh. Today, this award-winning nonprofit continues to operate in several states mobilizing communities to prevent liver diseases caused by hepatitis B and C among AAPIs, African Americans and other high-risk groups. Earning masters in fine arts and public health from Harvard, she is the recipient of the Rasmuson Individual Artist Award, the first Julius B. Richmond Young Leader in Public Health Award, the first National Award for Excellence in Public Health Leadership, the Sun Memorial Award for exemplifying a commitment to improving the health and well-being of people in underserved populations, and the Schweitzer Award for reverence for life. Her writing and photography has appeared or is forthcoming in Alaska Magazine, Backpacker Magazine, First Alaskans Magazine, Fourth Genre, Parenting Magazine, Rosebud Magazine, Smithsonian Magazine, Sierra Magazine, Under the Sun, and The Washington Post, of which several are excerpts from a memoir-in-progress including the essay named in Best American Essays. Hinaleimoana Wong-Kalu is a Native Hawaiian teacher, cultural practitioner, and community leader. Her work as an innovative teacher was highlighted in the award-winning PBS documentary Kumu Hina from which emerged A Place in the Middle, a nationally-recognized youth-focused, culturally centered educational program aimed at making schools and communities safe and inclusive for all. Hina serves as the gubernatorially-appointed Chair of the O'ahu Island Burial Council, charged with overseeing the protection and care of ancestral remains, and is leading a Hawaii State Department of Corrections program to empower offenders preparing for community reintegration. She was a founding member of Kulia Na Mamo, a community organization established to improve the quality of life for māhūwahine (transgender women), and served for 13 years as Director of Culture at Hālau Lōkahi Public Charter School in Honolulu. Hina is the recipient of the National Education Association’s 2016 Ellison S. Onizuka Memorial Award. Jenny Yang is a Los Angeles-based writer and standup comedian who produces a (mostly) female, Asian American standup comedy tour, Disoriented Comedy, and has been a writer and performer on the viral Buzzfeed videos that have amassed over 20 million combined views such as "Ways Our Asian Moms Say 'I Love You'" and the "Ask An Asian" video series. In 2015, Jenny produced the first-annual The Comedy Comedy Festival: A Comedy Festival, an Asian American comedy festival featuring the best emerging and veteran standup, sketch, improv, and writing talent. Drawing from her former career in politics, Jenny is a regular commentator on politics and pop culture with contributions featured on NPR, Southern California Public Radio, The Guardian, NBC News, BBC News, Al Jazeera America, and Pivot TV. She has been an actor and host in numerous digital projects including Comedy Central's White Flight and AngryAsianMan.com Phil Yu's Angry Asian America talk show on ISAtv, a new media platform created by Far East Movement and Wong Fu Productions. Jenny was dubbed one of Los Angeles' "most fascinating people" of 2015 in LA Weekly's annual "People" issue, and a featured standup comic on Joan Rivers' 2013 Showtime documentary Why We Laugh: Funny Women.